QuiGig.com is here! QuiGig boasts a safe and secure way to hire local service providers with ease. Unlike other gig-economy based websites, QuiGig will be affordable for customers, and attractive for service providers who want to gain new business. 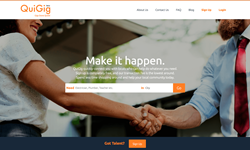 QuiGig Gig-Economy Website Launches; Quickly And Easily Hire Local Service Providers. Sign Up Today And Receive Complimentary Coins To Hire Your First Gig! On February 13th, gig-economy based company, QuiGig, will open its virtual doors to the community of Houston. QuiGig is a platform that connects people who need gigs completed with those who have the skills to fulfill them. The essential services provided by QuiGig will create a faster, safer, and (more importantly) a more affordable way to complete projects. QuiGig will accomplish these goals through a unique transaction system, an optimal user-experience, and an equal-opportunity driven hiring process. Ease of use is an essential quality to have in the current gig economy, and QuiGig is aiming to be the fastest and simplest way to get gigs done quick. QuiGig users (those people who need a gig completed), will spend less time and navigate through less windows when getting a bid. QuiGig providers (those vying for gigs) will be rewarded for prompt responses to users.To ensure quickness, QuiGig has instituted a “First Three System”, in which the first three bids sent to a QuiGig user from a provider are always free. This allows users to hire and be hired for a gig without spending a penny. Don’t waste your time - or money - and get your gigs done quicker! If a user is not in the “First Three,” or, if they want to perform any of the other services offered on QuiGig, they must use QuiGig Coins. QuiGig Coins are the unique currency system used to perform actions across the website. QuiGig has chosen to use a coin system instead of a more traditional subscription service, because each user is different, and should be able to personalize their experience on the platform. QuiGig users will be able to buy coins in bundles from 20 to 5,000 at a time. There will no longer be a need to pay a premium each time you reach out to a new person or pay for a service that you don’t often use. Additionally, 500 coins will be given to each user at the beginning of each month. New users can try out the service, learn more about how the coin system works, and what to spend coins on. The free coin balance will refill back to 500 each month, even if someone has already purchased coins. Throughout a user’s time on QuiGig, they will receive bonus coins. Whether you are QuiGig user or provider (or both - you can do that too! ), you will have the ability to use the system without spending the cash. Another unique QuiGig feature differentiating the site from its competitors is the non-discriminatory hiring process. Instead of showing a full profile before the hiring even begins, (thus opening the hiring process up to prejudice and stereotypes), QuiGig will only show information that is relevant to someone’s ability to complete the gig. This allows decisions to be made based off of the professional prowess of the provider. By leaving out personal information, providers can get hired without being hindered by factors out of their control. This process, plus the affordable and unique transaction system, will further ensure the possibility for any user, regardless of race, age or gender, to grow with the platform. The entire QuiGig team is working to bring new, active users on board and improve the overall user experience. The QuiGig project is currently in a Beta phase. Anyone interested in more information is able to contact the team directly via email at: info(at)quigig(dot)com or, give them a call at: (713) 999-5338.